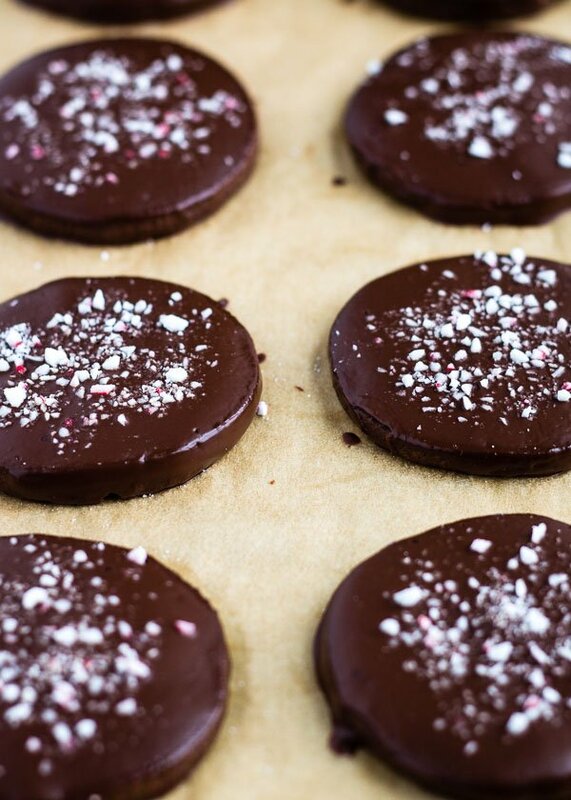 Also known as double peppermint crunch chocolate shortbread cookies. 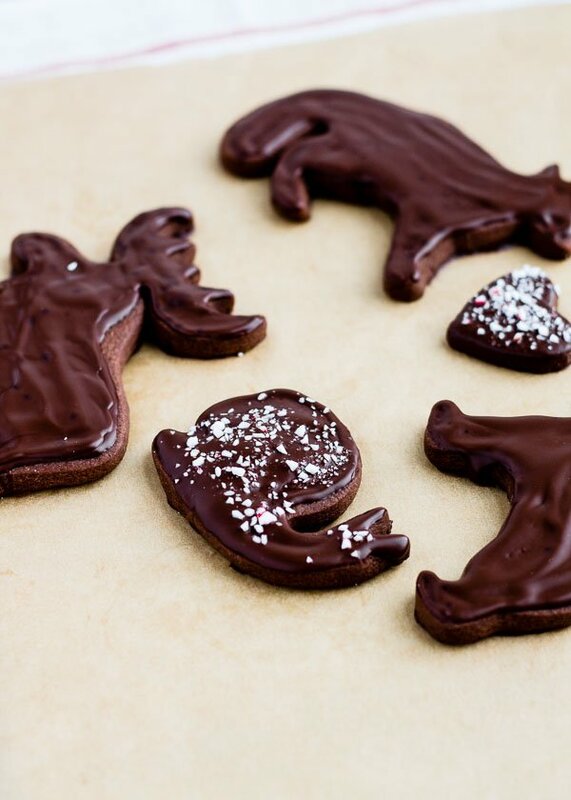 But let’s just call them Maine Squeeze cookies because I made a moose cookie (also a hedgehog and a snail) for my main squeeze and posted them on Instagram with the caption For my “Maine” squeeze. Get it?? They also got eaten in Maine. So they must be good, right?? 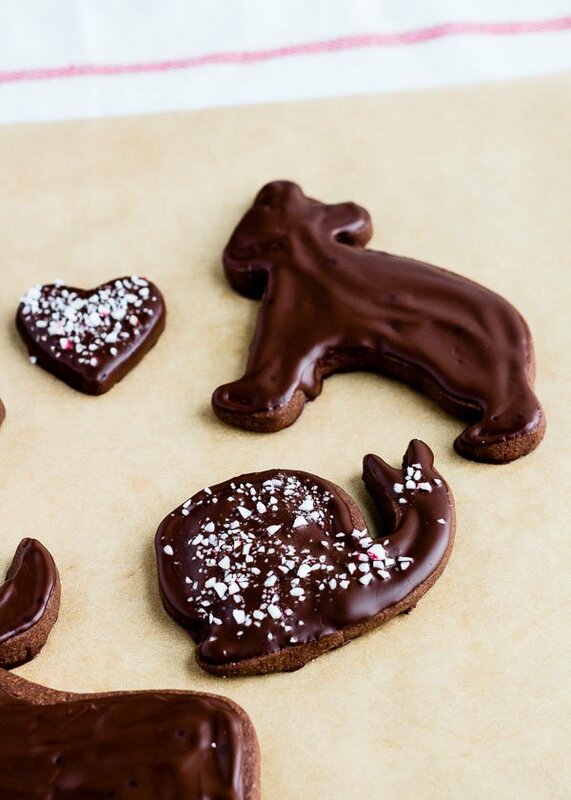 You can roll these out and use cookie cutters or you can roll them into a log to make slice-and-bake cookies. I did both. First I stamped out farm animals, then I rolled the scraps into a log, chilled until very firm, and sliced the log into round cookies. Efficiency! Oh, don’t forget the rich chocolate coating. It’s non-negotiable. Tag your photos #supernummy if you make these! Line a baking sheet with parchment paper and preheat oven to 375° F.
Whisk flour, cocoa powder, and powdered sugar together in a mixing bowl. Cut in the butter or pulse the butter with the flour mixture in a food processor, sprinkling in the peppermint and vanilla extracts towards the end, until a smooth dough forms. Either shape into a round disk for cookie cutter cookies or into a rounded log for slice-and-bake cookies. Wrap the dough in plastic wrap and refrigerate for at least 30 minutes. 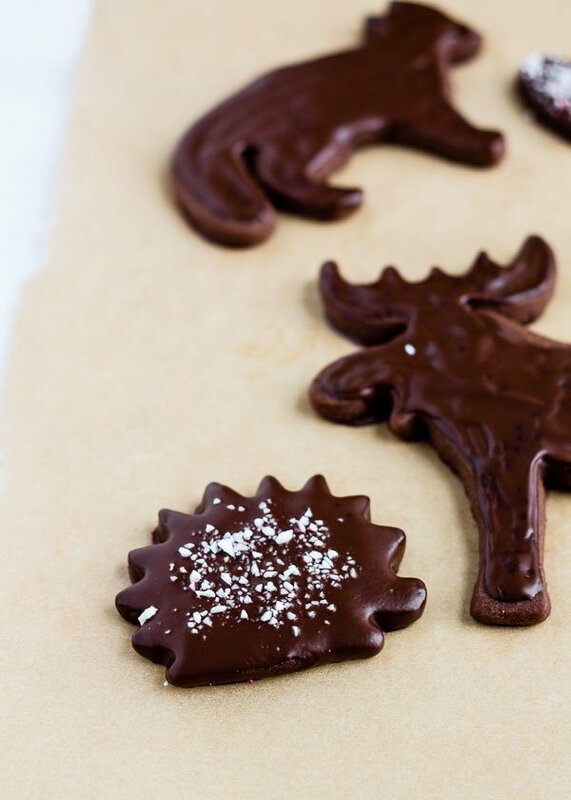 If using cookie cutters, roll out the dough until it's 1/3 inch thick. Otherwise slice the log into 1/3 inch thick rounds. You can roll the cookie cutter scraps into a log and slice them as well. Bake for 12 minutes, rotating the pan halfway through. I use an airbake sheet and bake in the center of the oven. For regular baking sheets, bake in the upper third of the oven. Let cool completely. Once cool, bring a small pot of water to a simmer, turn off the heat, and set a heatproof bowl with the chopped chocolate in it over the pot. Add peppermint extract and stir until the chocolate is melted. 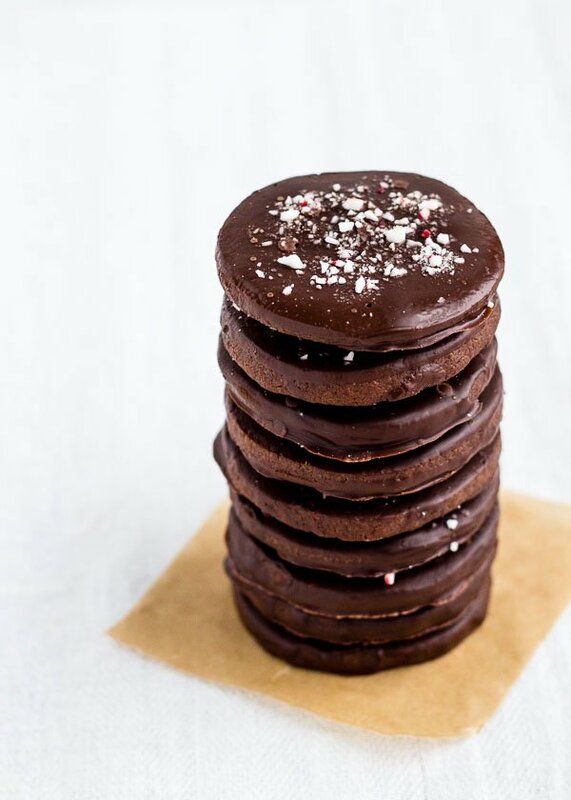 Dip each cookie in the melted chocolate. I completely submerge them, then gently lift them out with a fork. 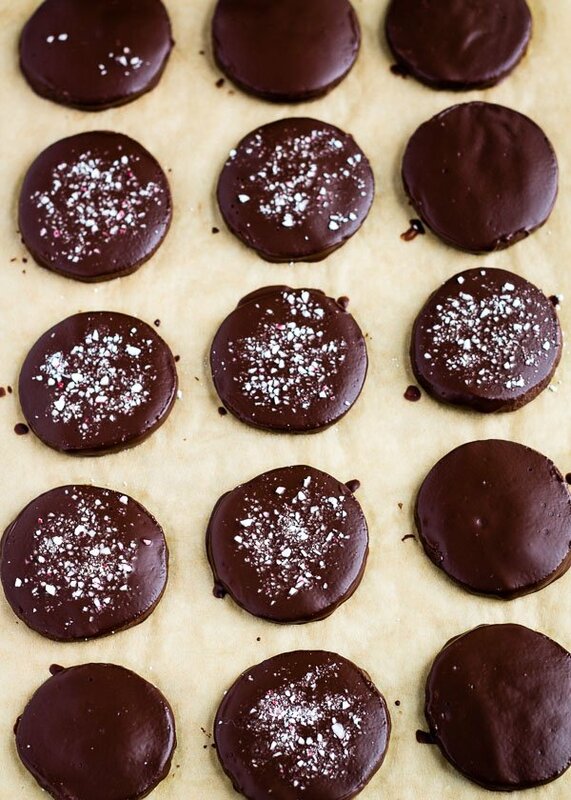 Place each cookie back on the parchment paper. 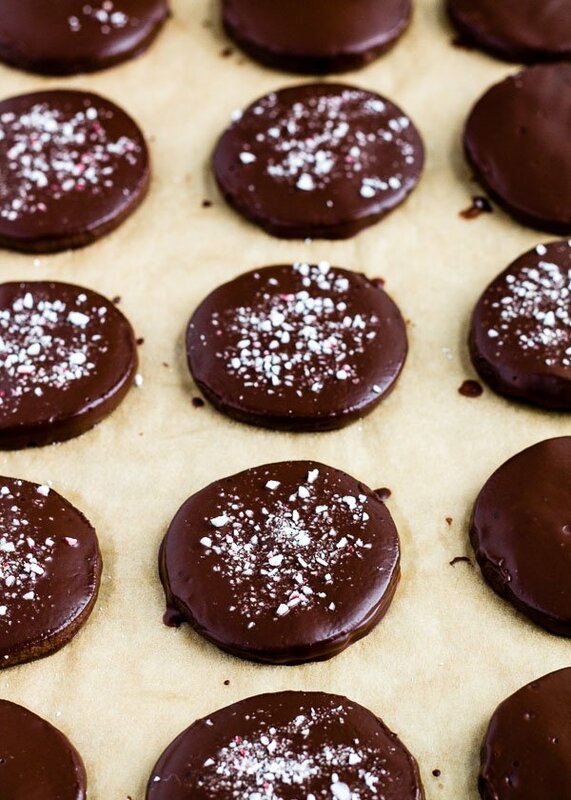 Sprinkle with crushed peppermint candy pieces and let the chocolate set in a cool, shady place (but not the fridge!). For the cookie cutter cookies, I roll the dough out right on the parchment paper, flipping a few times, then stamp the cookies and peel away the scraps. This dough isn't sticky so I've never needed to dust with flour or cocoa, but you may want to keep a little on hand if your rolling pin starts to stick. Ahhhh shucks 🙂 thanks Christine!! Oh so adorable! Maine is my absolute favorite state! Yes yes it’s an awesome place!! And there are a lot of moose/meese there haha.